[/av_heading] [av_textblock size=” font_color=” color=” admin_preview_bg=”] Cam, and wife Amanda were both born and raised in Melbourne. A move to the country was a perfect fit, with Cam discovering a passion for agriculture and grain growing. 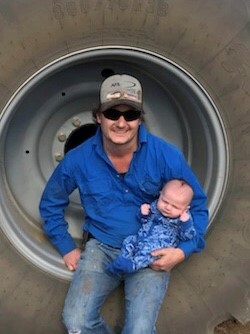 Today Cam and Amanda operate a contract hay business, and have grown their first grain crop. Working in collaboration with others has been the key to enabling this city born and raised family to make a start in grain growing.